Lynch during his time with the Seagulls. WATERFORD HAVE ANNOUNCED the signing of Kevin Lynch. The 26-year-old defender joins from Bray Wanderers, having arrived at the Wicklow club in 2016. Lynch previously lined out for top junior side Sheriff YC. He is added to the Waterford squad for the 2019 season along with Matthew Connor, John Martin, Dean Walsh, Rory Feely, Cory Galvin, Shane Duggan, Bastien Hery, JJ Lunney, Zack Elbouzedi and Ismahil Akinade. “I’m delighted to get signed and be sorted for next season,” Lynch said. “I was away for a few weeks but I’d met Alan [Reynolds] beforehand and again when I got back. I had a few other options around the league but to be honest once I knew the interest was there from Waterford it was an easy decision. “Everything appealed to me about the opportunity. Of course the European football is a big attraction, but when you look at the club and the facilities too; the training ground and playing pitch, it’s a pro setup. “I’ve played with Cory [Galvin] at Bray before so I’m looking forward to playing on the same team as him again. Last season was a tough one for me but this a great opportunity. Reynolds added: “Kevin is a strong left-sided player and he’s one I’m delighted to bring in. There were a few teams after him so it’s great that he’s signed for the season. Email “'He’ll be an important signing for us' - Waterford snap up Bray defender Lynch ”. 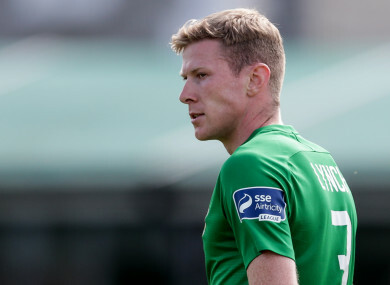 Feedback on “'He’ll be an important signing for us' - Waterford snap up Bray defender Lynch ”.